Originally from Virginia, I love sharing my southern hospitality and willingness to chat about whatever, minus the accent, giving me an easy way of making folks and their pets feel comfortable while bringing a sense of openness and passion to each portrait sitting. I am an award winning photographer and here's why. photographer for 62 years and my sister has for over 15 years. He recently won the Lifetime Achievement Award with the Professional Photographers of America. I am very fortunate not only to have one of the top five portrait photographers in the US as a mentor but also a father with creative genes. I have worked closely with him to pursue a passion of 30 years to become a professional photographer with a fresh outlook. I have an album of about 50 horses from a ranch in Chesapeake, Virigina that I made with my polaroid he gave me when I was 12. When I am not working, it is all about riding the trails of California or helping out the community. 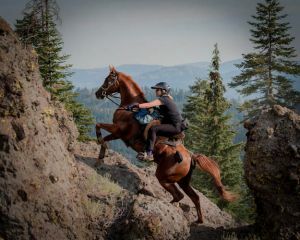 Here I am in the Sierras finishing 40th out of 205 riders in the Tevis Cup of 2012 with my horse Red Shai. A superstar climber who loves to move. Not many people photographers are comfortable with horses or are there many horse photographers comfortable posing people. I shoot from the heart, keep it simple, and let the true relationship create the connection. I love images that are natural and relaxed, yet vibrant and powerful. Beautiful fine art composition and lighting are always what I visualize to create a timeless artistic work of art to treasure forever.